It’s been a little while since the last posting but there has certainly been a lot going on. This week our private order of Garrison beers were released to consumers. The LCBO has been e-mailing everyone who ordered with instruction that they can now pick up their Garrison at the LCBO warehouse in downtown Toronto or have it shipped to their local store. It’s been quite a road to actually have the Garrison in hand. I’ve been saving some stories of the journey as I wanted to make sure the beer got here. Stay tuned for some of the tales of getting the Garrison into Ontario. 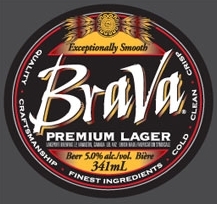 Today Brick Brewing announced that Labatt Brewing has sued them over trademark issues between Brick’s Red Baron brand and Labatt’s Brava brand. The announcement certainly raises an eyebrow regarding the conflict of interest that our beer retail network is owned by the major breweries (48.5% Labatt, 48.5% Molson) and their products dominate the network at the same time. 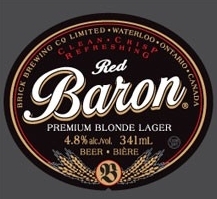 The news release says how Brick paid to participate in a Beer Store lobby display program, and also an additional fee for TBS to sort Red Baron’s bottles (since they are non-industry standard). In effect Labatt is taking fees with one hand as TBS owner then asking for more with the other hand as a TBS competitor to Brick. The release also points out something we’ve raised here before, that consumers generally have to ask for Brick by name. The label wall and general lack of shopping experience creates an environment where consumers can’t browse for beers at TBS, only look at their label on the wall. This certainly favours beers that consumers already know as they are less likely to try something new when they can’t see it. It is troubling to think that a brewery needs to watch its back not only from competitors but also the very distribution network that it relies on for its sales. A suit such as this could cause business hostilities between Labatt and Brick. Unfortunately in the restricted beer marketplace that we have in Ontario Brick would have very few options to sell elsewhere, so in effect they are stuck with them. You can discuss this issue on The Bar Towel forum here. If you’re interested, you can see here how much LCBO employees make to govern our alcohol retail industry. Here’s a funny story about what I needed to do to ensure that the Garrison private order met with the LCBO’s paperwork policies. After I submitted the order paperwork, all 104 pages of it, I was contacted by the LCBO’s private ordering department about Garrison’s address. For background, about three years ago Garrison moved locations in Halifax, from Lady Hammond Road to Marginal Road. When the order was submitted, it was cross-checked with the LCBO’s internal system which had Garrison in their database already. However, their database listed Garrison’s old address on Lady Hammond, instead of their present location. The LCBO told me that in order to have the order processed, they required a letter stating the new address. That didn’t seem like a big deal. However, what was incredibly strange was that they required the letter on the letterhead of the old address, not the current address. This didn’t make a whole lot of sense. Garrison has been at their current location for over three years. There wasn’t any letterhead from the old location anymore! I explained to the LCBO that Garrison indeed is at Marginal Road instead of Lady Hammond, and provided the web site for reference. Brian Titus, the president of Garrison, even provided a personal letter to the LCBO stating their location. It was all unacceptable – the LCBO required the old letterhead stating the move. I concluded that the LCBO just needed something on paper that met with their policy – no matter how legitimate it might be. So I asked the LCBO: “Could I just PhotoShop the current letterhead to reflect the old address?” Yes, they said. So that’s exactly what I did – I edited the current letterhead to read the old address, replaced it on the letter and submitted it. Accepted without question. This is a great example of the an organizational policy getting in the way of common sense. I assume that the intention of the policy is to prevent someone from falsely representing a brewery. But the obvious falseness of the solution makes the policy unravel. It’s a bit ridiculous, but just wait, there’s more to come. Beer Importing is an ongoing series documenting the process of importing beer through the LCBO. This particular series documents a private order of Garrison beers from Halifax, Nova Scotia. Nova Scotia has a provincial liquor commission that operates retail stores similar to Ontario, called the Nova Scotia Liquor Corporation, or NSLC. Their stores do a fine job of providing a range of wine, spirits and beer to consumers. For a province of about 1 million, there isn’t a huge market for specialty products, or so one might think. But the province has been very forward-thinking to allow for specialty products regardless of the size of their market. Over five years ago the NSLC implemented the Private Wine and Specialty Store Program, which does just what it says – allow for private stores. The original objectives of the program was to improve service and selection to consumers and provide an opportunity for small business. What this program gives residents of Nova Scotia is more choice. There are still NSLC stores that service the province, but there are also private stores such as Premier Wine and Spirits and Bishop’s Cellar that have opened offering consumers greater selection. The program has been successful, and the government renewed the program for a second five-year term in 2007. 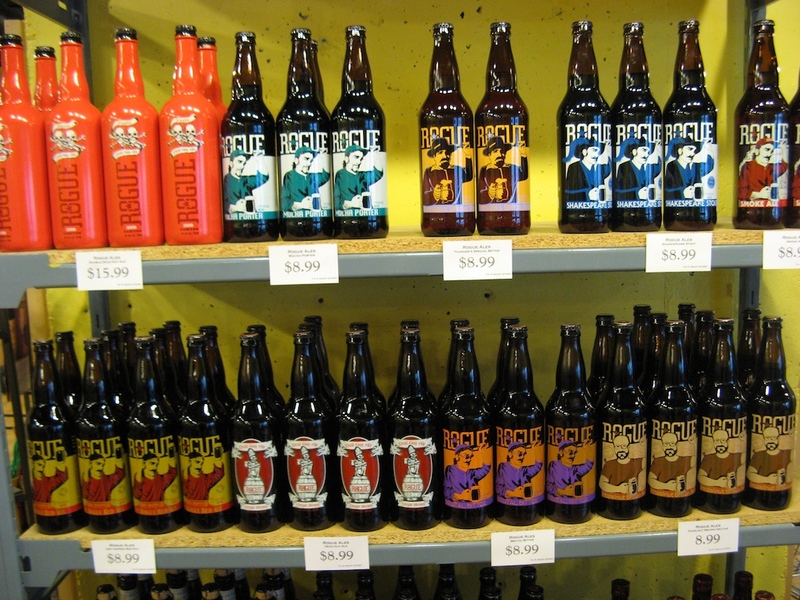 A recent trip to Premier Wine and Spirits in downtown Halifax demonstrated that no matter how small a market size, when specialty beer selection is permitted niche stores can succeed. 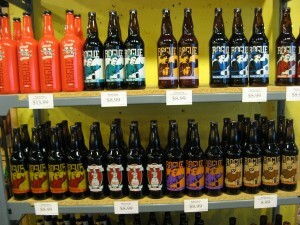 Premier offers a full range of Rogue beers, both their specialty and regular offerings. North Coast was also available, in both single bottles and six-packs. Flying Dog was available too, as was a couple of brands of Dieu du Ciel. With the exception of Rogue Dead Guy Ale, none of these beers are regularly available in Ontario. I don’t think North Coast has ever seen the insides of the borders of Ontario. Generally speaking the selection of beer in Ontario does top Nova Scotia, due to the sheer size of this market compared to the Maritimes. But it is fabulous to see a provincial government allowing private retail along side their own – something that we at Free Our Beer completely support. The Nova Scotia government still operates all NSLC stores and more importantly, collects taxes on liquor. But consumers win as they have greater selection, and entrepreneurs win as it is possible to set up specialty stores to satisfy niche markets. Take note Government of Ontario. The way a private order works conceptually is simple. There’s a certain number of cases of beer to sell, so consumers are found who are willing to buy the cases until the set number is hit. In an attempt to simplify how consumers can participate in private orders, I created a web site whereby consumers could enter their personal information in a form, choosing the beer they wanted for themselves. This would make the initial steps to joining the order easier, as agents such as Roland + Russell accepted private order requests via e-mail. After launching the news about the import business and the order site, the Garrison order sold out very quickly – in about 3 and a half days. But then came the paperwork. The LCBO has a specific order form that must be completed for a private order. Since this private order had multiple buyers, the form had to be completed for every individual buyer. On the form had all the details about Garrison, the buyer’s personal details, the beer order (brand, alcohol percentage, case size and price quote), and the deposit estimate. For a private order to be processed, 25% of the estimated retail value of the beer must be paid up front. I generated these order forms for each buyer, but they could not be submitted just yet. I had to collect everyone’s credit card details (for the deposit), get a signature for the order and get another signature for the lab testing waiver. For anyone who is familiar with the LCBO, they will know that the LCBO tests products that they sell. A good idea in theory, but has led to some unfortunate cases. What is also unfortunate is that the LCBO charges for testing, and that charge is passed along to the agent and brewery. The testing is in the area of $150 per brand, so you can imagine that for a small order this cost would have an impact on the end price. However, the lab waiver only applies if the products are for general sale or bars/restaurants (if there is more than 5 cases of any particular brand, that is). Since this private order was not going to LCBO stores nor bars or restaurants, the buyers in this order were permitted to request the lab waiver, which basically releases the LCBO if the products cause any “damages suffered”. As you can imagine, it is a fairly arduous task in putting all this together. I needed to get the order forms out to the buyers, have everyone complete the required information and get them back to me. But that wasn’t it. Garrison had to complete a banking application (fairly standard) and also provide a letter stating that they had the product to meet the requirements of the order. Also required was my AGCO license, plus the letter stating my appointment as Garrison’s agent. Finally I also wrote a cover letter formally requesting the order, with the brands, case quantities, alcohol percentages and country of origin of the products. All told, to complete the necessary paperwork to submit a single private order to the LCBO required a 104 page document. Now things would get interesting, as this formally begun my relationship with the LCBO. As you can imagine, a lot goes into the price of a case of beer that you pay. It starts, of course, with the cost from the brewery itself. I’m sure this is the case with many industries – the original price is topped up with all kinds of stuff, just like an airplane ticket. On top of the base price there’s freight, or the cost to ship the beer from the original brewery to here. Then there’s the excise tax, which is a federal cost per litre applied to the beer. With Garrison, this was already paid since they’re a Canadian brewery and as such did not apply. The LCBO takes some “cost of service” as well – markups specifically for In Store Cost of Service and Out of Store Cost of Service. Not sure what exactly that goes towards, but I can make an educated guess that it’s to help fund their business. Since the Garrison order was private and would not go in store, that cost of service did not apply, but the out of store did. There’s also something called a “Basic Fee” and a “Volume Levy”. If the bottles are non-refillable, there’s an environmental levy as well, but since Garrison’s are that didn’t apply. Finally there’s the bottle deposit, which of course consumers get back. And don’t forget about taxes. You’ve got GST at 5% (the LCBO’s worksheet was wrong, it listed 7% and I corrected it), and PST, which on alcohol is 12% in Ontario. After all that I was finally able to arrive at a price which was published along with the available brands at the launch of the private order. I’m sure I’ll get more familiar with what all the costs apply to as we go along. But I’ve quickly learned that there’s no handbook or manual to working with the LCBO – it’s a big organization with many people and you might get different answers depending on who you talk with. I sure hope, for the sake of the order and everyone who participated in it, that the Excel file that was given to me was accurate. Once all the agent paperwork was finished, it was time to get down to business. Working with Brian Titus, the president of Garrison, we decided the best first step to bring Garrison to Ontario was a private order. Basically there are three ways beer can be distributed in Ontario. The first is to have a listing at the LCBO or Beer Store. 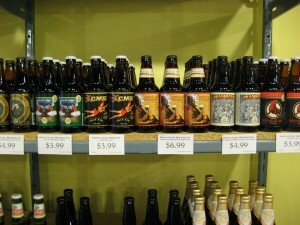 In the case of a listing, beers must be submitted to the LCBO for consideration and they choose what goes on the shelf. A brewery can also list at The Beer Store, which although does not involve a selection process, does require the payment of listing fees and a minimum level of sales to be met in order to be maintained. Coupled with the poor retail experience The Beer Store isn’t always a ideal choice. The second way is through consignment, which is where beers are kept at the LCBO warehouse for sale, but not put on the shelf. Unfortunately since the LCBO is the only entity authorized to store beer, they have a limited amount of warehouse space – agents cannot store the beer themselves and re-sell. And since I am a new agent, from what I understand the LCBO would not grant me consignment space until I have more experience and a proven track record. So that’s a consideration down the road. The third way – and really the only way that eliminates the LCBO from the decision-making process – is a private order. A private order is just like it sounds – a private order of beer that is arranged between the agent, brewery and private consumers. With the right paperwork, a private order is the best way for agents and breweries to bring the beer to consumers that they wish. Once Brian and I decided on doing a private order, we chose the brands to offer. For cost efficiencies (namely shipping), a full pallet of cases was the best bet. This would be about 80 cases of various brands of Garrison’s: their award-winning Imperial Pale Ale, the new seasonal Sugar Moon Maple Ale, and a mix-6 pack featuring different beers. This would offer consumers a wide variety of Garrison beers to choose from. Next up came pricing. Here’s where things started getting interesting. In order to estimate what consumers would actually pay for cases of beer from Garrison, I needed to understand how the pricing model worked. After asking around, I received from the LCBO a Microsoft Access database that was to allow me to key in the base price and find out an approximation of the end price. Unfortunately the Access DB that I was provided was not compatible with the most recent version of Access. I went back-and-forth with some IT folks at the LCBO to no avail – although helpful I never got a DB that worked with the latest version of Access. Getting frustrated with having to troubleshoot an incompatible Access DB, I asked if there was an Excel spreadsheet that would do the job. There was, and it was provided to me. But it was something else to figure out. That’s for the next chapter, coming up. Becoming an agent in Ontario (also known as “Manufacturer’s Representative”) is not as easy as declaring “I’m an agent now!” The first step in becoming an importer in this province is actually quite challenging, and I’ll explain why. Agents are licensed by the Alcohol and Gaming Commission of Ontario (AGCO), the government body responsible for alcohol regulations and licensing. The AGCO approves licenses for agents, but also for brewers and pubs, amongst other things. When looking at the forms required to become an agent they are pretty straightforward – personal and company information, personal history, corporate structure – that kind of thing. And the fee is only $30 for two years, not too bad either. So hang on a second. In order to actually become an agent, you need a brewer who is willing to have you as their agent first? That’s the case in Ontario. I even called to confirm with the AGCO, who told me that was just the way it was. I was told to ‘sell myself’ to potential clients. This was like getting my first job all over again. You can’t get the job without experience, but you can’t get experience without the job. So in order to become an agent, I needed to find a brewer who would have me as their agent, even though I didn’t have experience and wasn’t actually an agent. I contacted a number of brewers late last year inquiring about Ontario representation. I explained that although I wasn’t technically an agent, I did indeed have a strong knowledge of the Ontario marketplace through The Bar Towel and was well prepared to take the leap into representation. Luckily I had The Bar Towel credentials otherwise it would have been definitely challenging to convince a brewer that I was prepared and had the knowledge to help them in this marketplace. Thankfully I was able to link up with Garrison Brewing of Halifax, Nova Scotia, who after a number of discussions and valuable outside recommendations, agreed to have me as their agent in Ontario, which I am incredibly grateful for. I diligently completed my application forms, and was approved by the AGCO without any issues. I do find it odd, however, that one must jump through this particular chicken-and-egg hoop to acquire a license. I suppose it is done to ensure that only serious applicants apply. But it is certainly a roadblock to getting in to this business – the first one I’ve had to face – and luckily able to overcome.